“Violence on the Internet is both a reflection and a generator of violence in other environments. It is therefore important to work from a holistic and child rights perspective to address the factors that create or increase risk, vulnerability and impunity. It is also crucial to promote measures that empower children, enhance their resilience and offer opportunities for their active participation in the prevention and response to violence online as offline.” said SRSG Santos Pais. 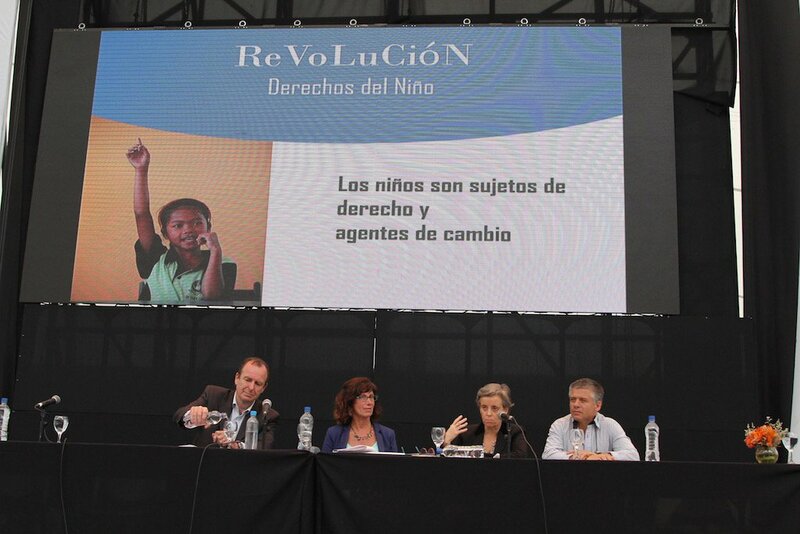 The Regional meeting was organized by Chicos.net alongside with RedNatic (Latin American network of organizations for the rights of children and adolescents to a safe and responsible use of ICT) and Save the Children. SRSG Santos Pais participated in all four workspaces created in the event: the Latin American Teenagers Forum, the Symposium on Law and Public Policy, the Educational Community Working Day and a Meeting of the Red Natic members. “We have to do more than trying to avoid online threats. For children to become digital citizens, it is important to recall that our core values apply also on-line, including a strong sense of responsibility, respect and concern for others.” highlighted SRSG Santos Pais. The meeting aimed at encouraging peer exchange to learn experiences, explore opportunities in the use of ICTs and to promote school and community work related to Digital Citizenship and Digital Literacy. Children called for an active dialogue with teachers, Governments, NGOs specializing in digital rights and education, social workers and other relevant civil society actors to work together to develop advocacy strategies to promote the right to a safe, responsible and meaningful use of the various technological devices available today. The young participants engaged in lively discussions with SRSG Santos Pais expressing concern about some of the risks associated with the use of ICTs, including harmful content in the Internet that promotes eating disorders and cyberbullying. They identified violence as one of the biggest obstacles to their healthy development. “The research we are currently developing on cyberbullying shows very clearly the relationship between cyberbullying and violence and discrimination in school or the community. Governments, local decision-makers, parents, civil society organisations and the industry need to respond to children’s concerns by taking decisive action to protect them from violence in all settings and at all times” added SRSG Santos Pais. Children’s views captured at the event, confirmed the findings of the SRSG report on ICTs Releasing Children's Potential and Minimizing Risks - ICTs, the Internet and Violence against Children. They will also inform the preparation of the Secretary General’s report on the protection of children from bullying to be submitted to the General Assembly in 2016.